One of the main goals with Skritter is to help you learn to write characters. We believe that using Skritter’s unique combination of real handwriting, corrective feedback and spaced repetition is far superior to using just paper and pencil. Not to mention that it’s more fun! As is the case with any review system, there is a distance between what we practise and what we want to use it for. Practising writing characters with Skritter on the web, iOS or the recently launched Android app is similar to writing characters on paper, but it’s not exactly the same. In this article, we’re going to start looking at some of the differences and how they affect your studying. Examples used here will be in Chinese, but the general principles are of course the same for Japanese; this article is for all Skritter users! Before we get started, however, it should be noted that most of the differences between using Skritter and writing on paper are quite small and a majority of them are to your advantage, such as alerting you to incorrect stroke order or telling you that a stroke is written in the wrong direction. Paper doesn’t care about any of these things and even teachers need to pay attention to notice. Skritter does this automatically! When deciding how Skritter interprets the strokes you write, we have to make a decision how strict the interpretation should be. It’s obvious that we can’t require you to write exactly like the model character, but neither can we allow strokes that differ too much. The current state is a compromise between the two and we constantly update character models and interpretations to enhance the learning experience. Don’t let Skritter help you too much! Still, if your goal is to write clear, correct characters, there are situations where Skritter will help you too much. This is fine if you pay attention, which is one of the main reasons for writing this article: we want more users to pay attention. One of the problems can be easily overcome by activating a function in Skritter called raw squigs, but let’s look at the problem itself before we solve it. Skritter attempts to determine whether the strokes you write matches the model or not, but a computer program can’t know what you intended to write. Since there needs to be some margin for error built into the program, strokes will be interpreted as correct even if they are somewhat out of place or slightly wrong in some other way. In most cases, this is okay. 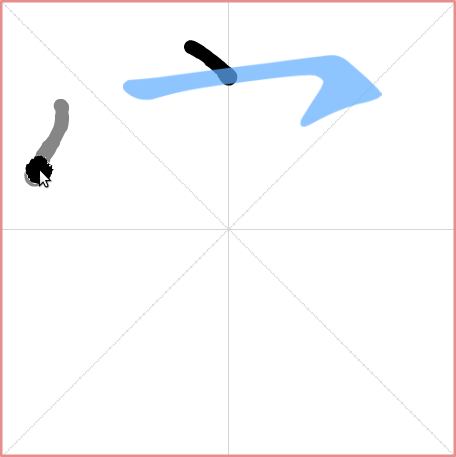 In this example, Skritter moves an incorrectly placed stroke to another position than the one we intended, while still treating it as a correct stroke. This gives us a very important hint how to write the character, a hint that wouldn’t be available to us if we wrote on paper. 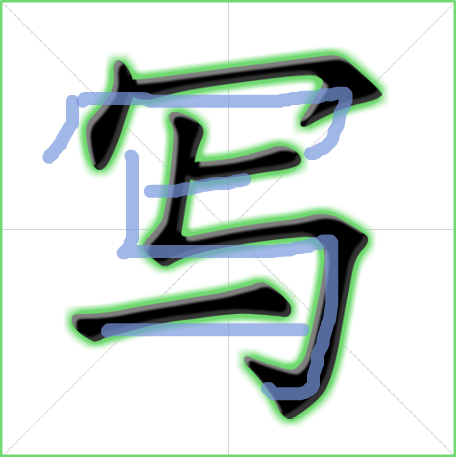 We thought there was a 口 to the left, but in fact there isn’t and Skritter shows us that by moving the stroke as shown above. If we use this hint and get the character right, we are effectively cheating ourselves. We wouldn’t have been able to write this character on paper. 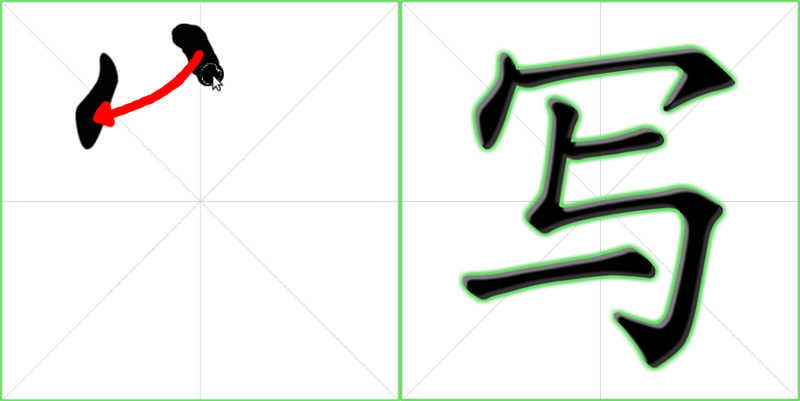 In the second case, we intended to write a right-sloping dot as in the first sttroke in 穴, but Skritter interprets this as as the first stroke in 冖, which is sloping in the other direction (and is slightly off-centre as well). Thus, we indented to write one radical, but it turns out it’s not the right one. Skritter tells us that we were wrong and shows us the correct stroke by moving and rotating the stroke. 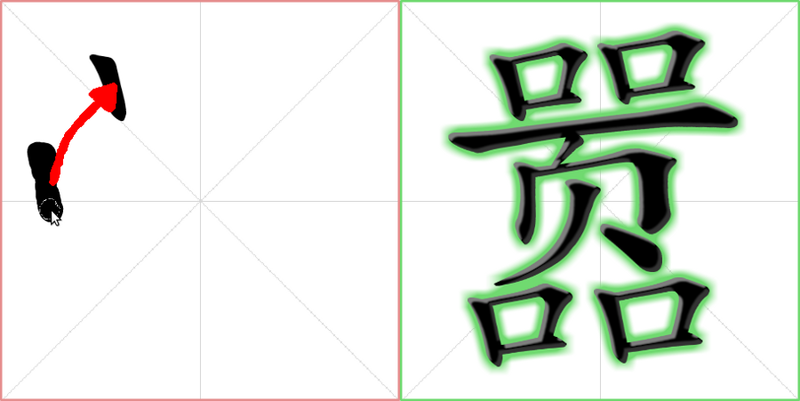 If we would have written this on paper, we might have ended up up with an incorrect character (one with a dot above 冖), so we should treat this character as forgotten (incidentally, the traditional character for 写 does have a dot: 寫). Apart from being vigilant and paying attention to these and similar cases, you can also turn on a function called “raw squigs”. This is a function that show you what you actually write rather than snapping your strokes to the model character. This means that you won’t receive any hints about position or stroke direction, thus taking your reviewing one step closer to the way characters are written without feedback on paper or elsewhere. You can see what Skritter looks like with raw squigs turned on in the picture to the left. Note that our strokes (light blue) are still visible. The model character is only shown once we finish the entire character. If you want to know more about this and see some animated examples, I have produced a video on YouTube about raw squigs. If we look at our example with 写 above, we would run into problems very quickly and it would be easy to spot them. Just look at the picture to the right. If we try to continue writing the character as indicated (left-sloping dot where the cursor is), Skritter won’t accept it and will eventually show us the correct stroke (light blue). Since that stroke is very different from the one we intended, it’s obvious that we are wrong here and we should treat the character as forgotten. Enabling raw squigs is easy. In the web application, simply open the settings page by clicking the cogwheel in the top right corner and then check the raw squigs box in the bottom left corner (see screenshot below). For mobile devices (iOS and Android), go to “Settings” and then enable raw squigs. Enabling raw squigs will make your characters look uglier and you will decrease your retention rate a bit, but since you are judging yourself more harshly, you will end up with better handwriting skills. Naturally, if you don’t think correct handwriting is very important, you don’t really need raw squigs. You can learn a lot about characters, both writing and recognition by using the default settings, but if you want to be able to write characters without help, you should turn raw squigs on. In my opinion, decreasing retention rate and feel slightly worse about my character writing is a fair price to pay to improve my character writing.